BLISTER is a publication created by and designed for people who give a damn about the details and who love to get after it outside, so we want to get your thoughts on how we’re doing. To try to make BLISTER as valuable and as interesting to you as possible — and to ensure that we are able to keep producing wholly honest and independent reviews — it would be extremely helpful to us if you would take a few minutes to complete this survey. These results will help us maintain our independence, refine how we do things, provide more value to you, and give us a better sense of what you’d most like to see from us. 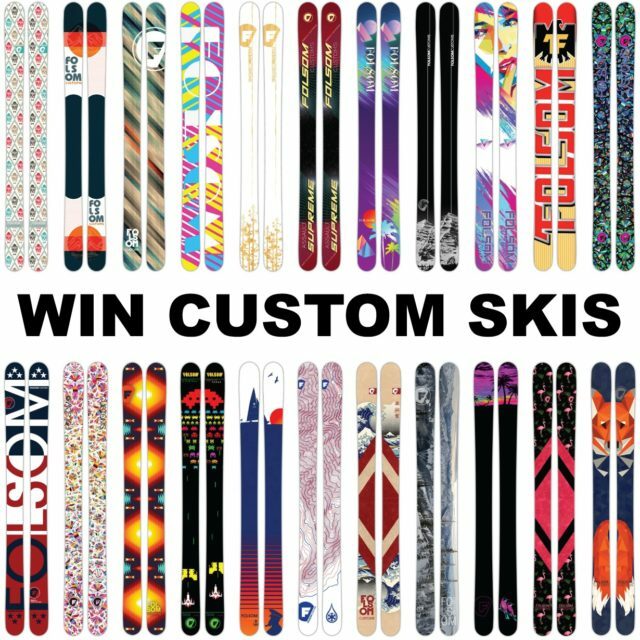 And as a way to thank you for sharing your thoughts, complete this survey and you will be entered to win a $1300, fully custom ski from Folsom. And if you do win, we’ll be happy to offer our two cents on the shape, construction layup, rocker profile, flex pattern, etc. that might be really sweet for you personally. Thank you for sharing your feedback with us, and we promise to keep trying to do things better and better. Just a few of Folsom's shapes and available graphics. I’d probably give a lobe of my liver for a set of Folsom Trophy Carbons with Shift bindings. It regrows right? Survey sent. Thanks for the great content Blister! “BLISTER” my eyes from Staring dreamily into the PURE UNADULTERATED MOJO radiating from the most beautiful extension OF THE SOUL anyone could ever adorn on THY FEET. Ha, thanks Casey. We don’t know all that much about the liver, but we do know that you can’t put skins on a liver and walk up a mountain. So in our considered opinion, we think a little of your liver for this setup is a great trade. And Ian … I don’t quite know what all of that means, but (1) it sounds very Dionysian in a good way, and (2) I’ll have some of what ever you’re having…. I like your reviews and product testing. Wish the reviews came out more often…. My son wants to enter as do I and I was wondering if there are any age requirements? Hi, Chris – everybody’s welcome. Are you coming back to NZ this year? Mt Hutt’s looking pretty good already. I’m a newb to the Blister fan club and have been awesomely impressed with the ideas and culture you demonstrate!!! There is nothing like a gnarly pow bluebird, I love being reminded of those killer days when I see your posts!!! Keep sending the sweet! I give a damn! Many, MANY thanks, Meg. That means a lot, and we promise to keep giving a damn too. I get serious gear coveting happening whenever I read your reviews. OK now this would be amazing!!! Your reviews are spot on and a set of PowFish for next year would be the perfect ending to an amazing season here in Colorado. Pick me Blister!! !